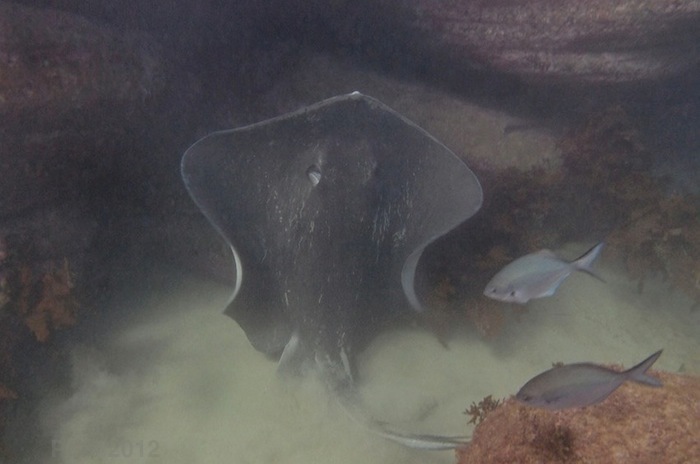 Today I went for a dive and the first thing I saw was a Smooth Stingray. An enormous animal, like a flattened submarine or a sea-going stealth-plane, it was sitting on the sand in a hollow between some rocks. This is the largest stingray species, growing to 14 feet long and weighing over 700 pounds. They are watchful and inquisitive. 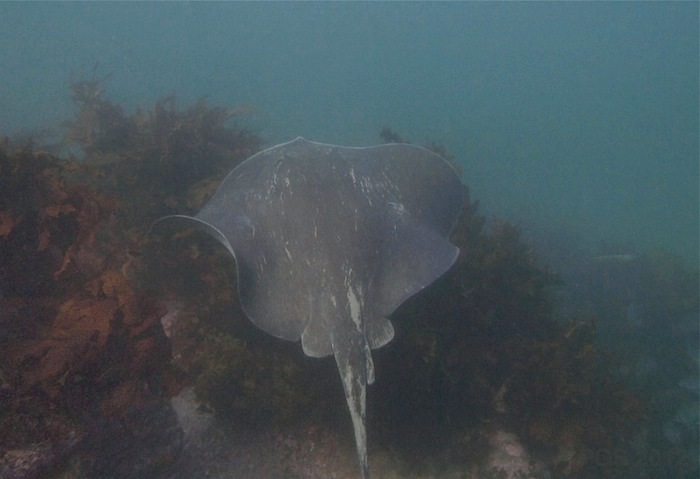 This is the ray that killed Steve Irwin, with a stab of its barbed tail. They’re not supposed to be aggressive animals, but when they come in to the shallows it always looks like some warship, built for carnage and the most hostile environments, is visiting an uneasy port. I crept over a rock to get a look. It stirred, raised its body, steered up over the rocks, and swam with great slow wingbeats out to sea. 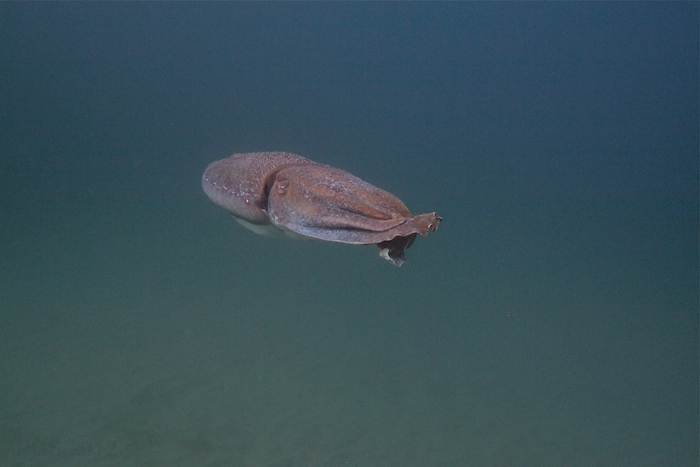 A little later I found a Giant Cuttlefish, a male cruising around. I had seen this one touring the area for a couple of days. He was getting a bit old and beaten-up. He wandered about in the shallows and then he, too, came up higher in the water and turned towards the sea. Orange-pink-and-grey, soft bodied with no weapons, swimming backwards and holding his arms together behind him, he seemed such an unlikely animal to be heading that way, in the same direction as the grey submarine with the venomous tail. He kept going straight northeast and it got deeper below, over featureless sand. I turned round and swam back on the compass. Posted in Cuttlefish and tagged cuttlefish, stingray. permalink. Yes, in Australia. In the Sydney area. 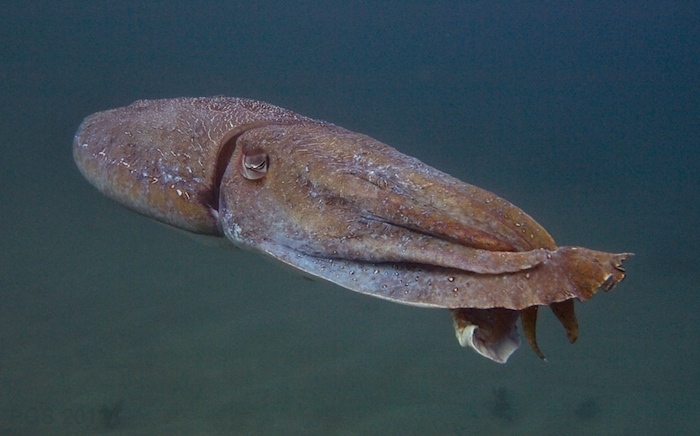 It is remarkable what lives in the sea just around Sydney.